RAJINI EVENTUALLY FINDS RADHIKA IN GOA? We all know that Goa was also one of the locations in the shooting schedule of Kabali. “Naan unai kaanum varayil thaabatha nilaye, desangal thirindhen thaniye thaniye” is Radhika’s words in the song Maya Nadhi. Desangal? Rajini standing, likely on Goan shores, also feature in the song’s visuals. Relating the two pieces of evidence, could it be said that Rajini finds Radhika in India? Possibly Goa? This page hosts a weekly slideshow related to Tamil movies. Each slide includes a picture and some description about that picture. All the slides will have a recurring theme. People looking for actress stills, actress images, actor stills, actor images, movie stills, movie images, and other interesting topics, relevant issues in Tamil cinema will find this page useful. Rajini eventually finds Radhika in Goa? 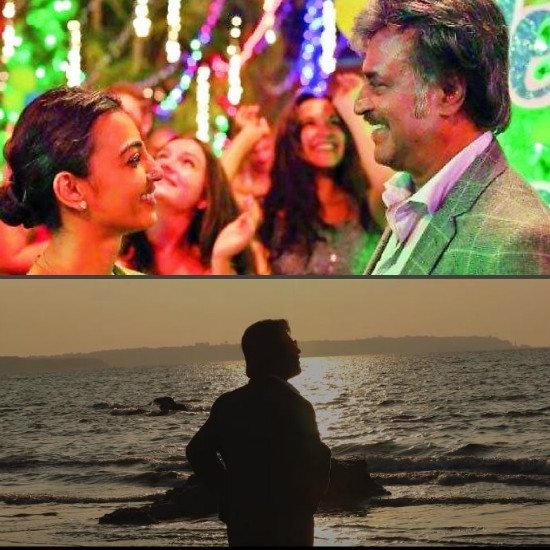 | 9 things the Kabali album reveals about the plot.